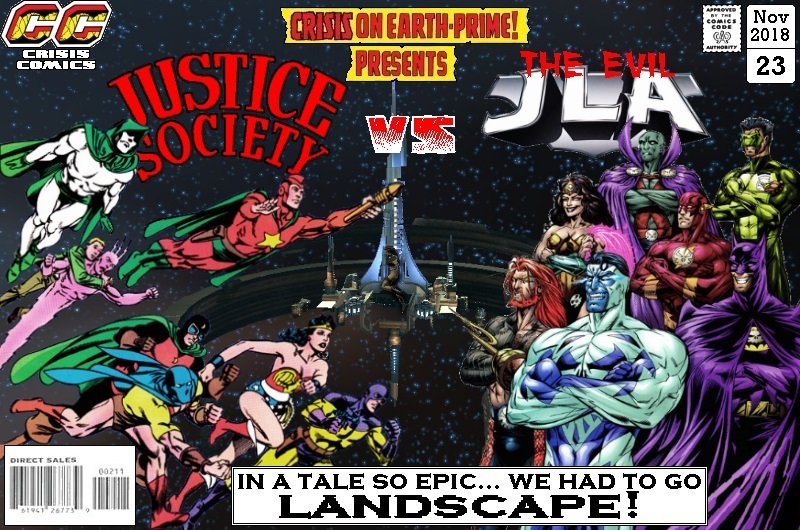 Let’s face it: sooner or later, there had to be a Justice Society/Justice League crossover, didn’t there? I mean, they practically invented the whole thing. Posted on Wednesday, November 7, 2018 Monday, October 15, 2018 by GaryPosted in Mash-UpTagged Aquaman, Atom (Al Pratt), Batman, Dr Mid-Nite (Charles McNider), Flash (Wally West), Green Lantern (Kyle Rayner), Johnny Thunder, Justice League, Justice Society, Martian Manhunter, Sandman, Spectre (Jim Corrigan), Starman (Ted Grant), Superman, Thunderbolt, Wonder Woman. While we eventually got to see one during Morrison’s JLA run, this particular one would’ve been really cool to see….even if the evil JLA turned out to be holograms. Always did like those designs though. From memory, didn’t the hardlight evil JLA just turn up for one, maybe two issues and then bang, they’re gone? Pretty much yeah. Still love those covers that featured them and those designs too. So simple, yet so effective. They need to come back, first as they were in ’97, then be remade to reflect the current League.